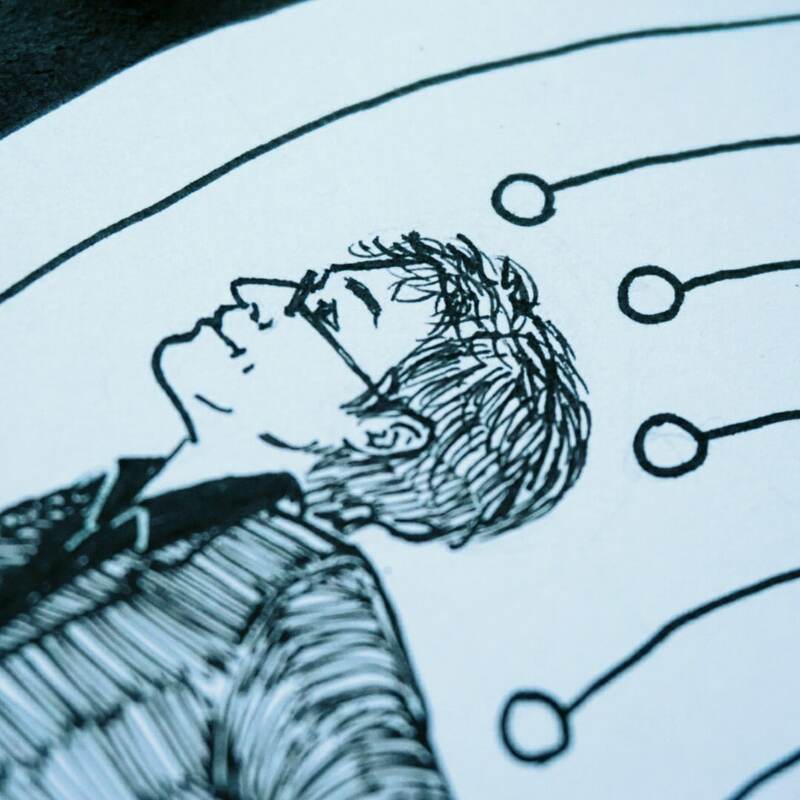 Inking Science day 10 - Carlo Rovelli and the nothingness of time. I stop and do nothing. Nothing happens. I am thinking about nothing. I listen to the passing of time. This is time, familiar and intimate. We are taken by it. The rush of seconds, hours, years that hurls us towards life then drags us towards nothingness … We inhabit time as fish live in water. Our being is being in time. Its solemn music nurtures us, opens the world to us, troubles us, frightens and lulls us. The universe unfolds into the future, dragged by time, and exists according to the order of time. What could be more universal and obvious than this flowing? Reality is often very different from what it seems. The Earth appears to be flat but is in fact spherical. The sun seems to revolve in the sky when it is really we who are spinning. Neither is time what it seems to be. Carlo Rovelli is one of the few brave souls in physics that have accepted the challenge to conjugate the quantum realm with relativity: his answer is gravity loops. Loop quantum gravity theory describes a universe where the space-time itself is quantised. Except that for some equations of quantum gravity, time is not needed at all. We know already from relativity that time is nothing more than an additional axis in our system of reference, with nothing more special than the fact that events move toward higher entropy. Past, present and future can all be mixed depending on where in space you are looking at a certain event. More convincing is the knowledge that at different altitudes on earth itself, time is different (there is even an app to calculate this). Rovelli argues that time is not only confusing and messed up, but it doesn’t exist at all. It is a construct we had to invent due to our inability to look at the world with absolute precision in every detail (e.g. because of the uncertainty principle). It’s our way to give meaning and causality to events. Of course, his is only a theory. With no experimental results supporting it. However, there is more to the story. The whole thing is complex hard-core physics, and yet his books on the topic appeal to everyone. He brought these topics to the general public. And the people loved them. For Seven brief lessons on physics (the first book that got him really famous), the publisher originally printed only 3,000 copies – who is going to buy a book about post-newton physics after all? – Within a year, they sold 300,000 in Italy only. Now it is translated in 42 languages and has sold more than a million copies worldwide. Sometimes we don’t give enough credit to society and its craving for knowledge. Whether time is flowing or not, that’s not the point. What matters is giving a voice to Science. A beautiful elegant voice that people can love and understand, like Carlo Rovelli had. Bonus – talking of voices: the latest book by Carlo Rovelli is The order of Time. The audiobook version is read by Cumberbatch. Is it only me, or this should already be enough to jump on it? Bonus for Italian readers: La mucca di Schroedinger (literally Schroedinger’s cow) is a division of DiRenzi Editore that shares information on scientific publications for the general public. In the past, they were even doing books giveaway in exchange for reviews (that’s how I got ‘What is time? What is space?’ by Rovelli back in 2010). Not sure they still do this, but DiRenzi definitely is worth checking.